Residuals, in the context of regression models, are the difference between the observed value of the target variable (y) and the predicted value (ŷ), i.e. the error of the prediction. The residuals plot shows the difference between residuals on the vertical axis and the dependent variable on the horizontal axis, allowing you to detect regions within the target that may be susceptible to more or less error. A common use of the residuals plot is to analyze the variance of the error of the regressor. If the points are randomly dispersed around the horizontal axis, a linear regression model is usually appropriate for the data; otherwise, a non-linear model is more appropriate. In the case above, we see a fairly random, uniform distribution of the residuals against the target in two dimensions. This seems to indicate that our linear model is performing well. We can also see from the histogram that our error is normally distributed around zero, which also generally indicates a well fitted model. The histogram on the residuals plot requires matplotlib 2.0.2 or greater. If you are using an earlier version of matplotlib, simply set the hist=False flag so that the histogram is not drawn. 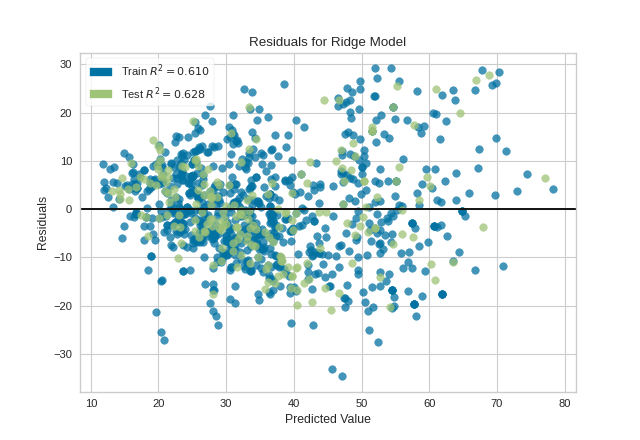 Regressor visualizers that score residuals: prediction vs. actual data. A residual plot shows the residuals on the vertical axis and the independent variable on the horizontal axis. If the points are randomly dispersed around the horizontal axis, a linear regression model is appropriate for the data; otherwise, a non-linear model is more appropriate. Should be an instance of a regressor, otherwise will raise a YellowbrickTypeError exception on instantiation. Draw a histogram showing the distribution of the residuals on the right side of the figure. Requires Matplotlib >= 2.0.2. If set to ‘density’, the probability density function will be plotted. If set to True or ‘frequency’ then the frequency will be plotted. Residuals for training data are ploted with this color but also given an opacity of 0.5 to ensure that the test data residuals are more visible. Can be any matplotlib color. Residuals for test data are plotted with this color. In order to create generalizable models, reserved test data residuals are of the most analytical interest, so these points are highlighted by having full opacity. Can be any matplotlib color. Defines the color of the zero error line, can be any matplotlib color. Specify a transparency for traininig data, where 1 is completely opaque and 0 is completely transparent. This property makes densely clustered points more visible. Specify a transparency for test data, where 1 is completely opaque and 0 is completely transparent. This property makes densely clustered points more visible. ResidualsPlot is a ScoreVisualizer, meaning that it wraps a model and its primary entry point is the score() method. The residuals histogram feature requires matplotlib 2.0.2 or greater. Draw the residuals against the predicted value for the specified split. It is best to draw the training split first, then the test split so that the test split (usually smaller) is above the training split; particularly if the histogram is turned on. If False, draw assumes that the residual points being plotted are from the test data; if True, draw assumes the residuals are the train data. kwargs: keyword arguments passed to Scikit-Learn API. Returns the histogram axes, creating it only on demand. 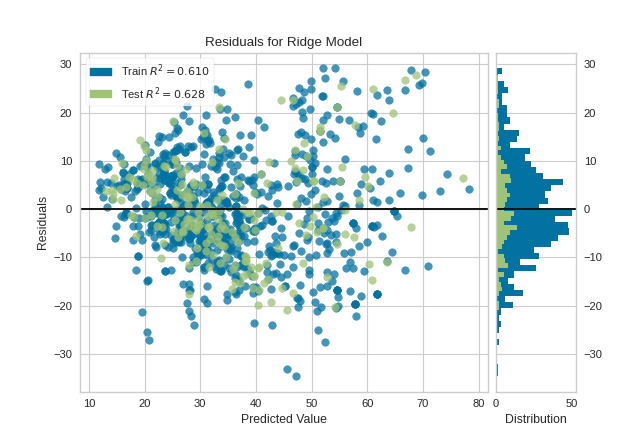 Generates predicted target values using the Scikit-Learn estimator. If False, score assumes that the residual points being plotted are from the test data; if True, score assumes the residuals are the train data. The score of the underlying estimator, usually the R-squared score for regression estimators.